Serious discrepancies in the Nagar Palika funds during 2003 have been unearthed, thanks to the use of Right to Information by a former Palika member Shashi Rawat. Former executive officer and accountant have been charged with the bungling of funds. Part-time and contractual teachers of Hemwati Nandan Bahuguna Garhwal University (Tehri, Pauri and Srinagar campuses) have called upon the Uttarakhand government to introduce a Bill regularising their services in the forthcoming assembly session. The state BJP activists staged a demonstration against the economic policies of the Congress-led UPA government at the Centre, here today. The benefit of cheaper petrol and diesel may be neutralised in view of the state government’s compulsion of maintaining revenue collection in the ongoing fiscal crunch situation. With just four days left for the Indian Military Academy (IMA) passing out parade (POP), the police administration has further intensified search operations and identification drive in the villages surrounding IMA. Albeit the state has four cricket turfs in Dehradun, none of them are being used during district tournaments by any of the cricket associations here. Hence, players going to other states find it tough to adjust to turf wickets. The turfs are there at the Indian Military Academy, Maharana Pratap Sports College, Abhimanu Cricket Academy and Doon School. While the ones at IMA, Abhyimanu and Doon School are for personal use of the respective institutions, the one at Maharana Pratap Sports College is too far away from the city to be of any use to players or for holding tournaments. The Gurukul University will host the Inter-University North Zone hockey tournament from December 10 to 16. The varsity is gearing up for the national tournament that will see the best of the talent from the northern region. 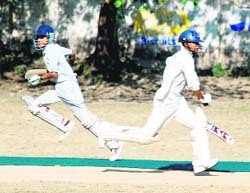 Rao Cricket Academy registered a thumping victory over Valley Boys Gujrada by a margin of 146 runs in the 57th District Cricket League tournament underway at Survey Stadium, here today. Rao Cricket Academy openers put up a stand of 59 runs for the first wicket. Dipankar Ramola scored 25 and Manish 15 runs, respectively. Thereafter, they lost some wickets in quick succession and were 81 runs for the loss of 5 wickets at one stage. However, the lower came good, thanks to a fine knock 28 runs by Sanjay. The Academy finally put up a score of 185 runs. LMCC Uttarakhand crushed Varanasi (UP) by 141 runs in the 23th Late Bankelal Shah Memorial Inter State Cricket tournament underway at Rangers Ground, here today. A team of two officers, one JCO and 12 other ranks that went for “Guard Trishul”, a multi-activity expedition in three disciplines - mountain cycling, trekking and white water rafting - was flagged in at GK Auditorium, Clement Town, by GOC, 14 RAPID (S), here today. Kickstarting the Dehradun municipal corporation Foundation Day celebrations by laying the foundation stone of a slum improvement programme at Katbangla, under the Jawarharlal Nehru National Urban Renewable Mission (JNNURM) in the Rajpur ward of Dehradun, state Chief Minister Maj. Gen. B.C. Khanduri (retd) said his government was committed to improving the living condition of slums. While stressing upon the need to improve the existing slums, the CM said it should also be ensured that no new slum comes up. “Pathetic living conditions in the slums was a matter of concern, but both the corporation and the district administration should also ensure that no slums come up in the city,” he said. Khanduri said he was hopeful that the new scheme would come as a big respite for those who had been aspiring for houses. Dehradun mayor Vinod Chamoli termed the development as historic. He said it was for the first time that the corporation had gone for such a slum development initiative. Local MLA Ganesh Joshi strongly advocated regularisation of slums. DMC chief executive officer Sushil Kumar said 90 per cent of construction costs of houses under the JNNURM slum improvement programme would be borne by the government. He said the beneficiaries would only be paying for 10 per cent of the costs that too in easy installments over a period of 10 years. The Kathbangla slum dwellings programme entails construction of 148 accommodations at a cost of Rs 6.22 crore. Later, while addressing mediapersons at the corporation office, Chamoli recalled the efforts undertaken by him in his seven-month tenure. He said while the city was undergoing transformation through better civic amenities, there were also efforts to increase the revenue of the corporation. He said for the first time the corporation had come up with a house tax policy, which has come as a relief for owners of old houses. Solid waste management for a clean city, beautification of parks and improvement in other civic amenities are being speedily undertaken, he added. The win of the Congress in the assembly elections in Rajasthan, Delhi and Mizoram has given confidence to the divided and demoralised Uttarakhand Congress party and added to the worries of the ruling Bharatiya Janata Party (BJP) in the state. The victory in the Delhi assembly elections has given a boost to the morale of the Congressmen in the state as more than two million Uttarakhandis reside in the national capital and play an important role in the politics of the state. Even before the inception of the separate state of Uttarakhand, natives of the state living in Delhi ran a prolonged agitation to press for the demand for a separate hill state. Congress leaders are jubilant that the results in Delhi will have a bearing on the coming Lok Sabha elections in the state. Uttarakhand Chief Minister Maj Gen B.C. Khanduri (retd) and his council of ministers had campaigned vigorously for BJP candidates in Delhi. “The results have shown that despite the best efforts of the BJP, including that of the Chief Minister, to whip up a frenzy of communalism and terrorism, the wise voters of the national capital have reposed faith in the developmental works of Chief Minister Sheila Dikshit,” said Uttarakhand Congress spokesperson Suryakant Dhasmana. “We are more determined to start our “Jail Bharo” agitation against the anti-people policies of Khanduri government from December 13 and to give a befitting reply to the BJP in the coming Lok Sabha elections,” said Uttarakhand Congress chief Yashpal Arya. Harish Rawat, former MP and senior Congress leader, has also hailed the victory of the Congress in Delhi and Rajasthan. He said that voters have given a warning to the BJP for politicising the issues of national importance and security. After winning the civic and Panchayat elections in the state, the ruling BJP is confident of doing well in the Lok Sabha elections. The state has five Lok Sabha seats and the Chief Minister Khanduri had claimed that party would win all seats. In response to an appeal made by Shashi Rawat, the chief information commissioner (CIC) has directed that departmental proceedings be initiated against Raj Kumar Saxena, former executive officer, and Ved Prakash Gupta, former accountant, who have allegedly been involved in misappropriation of Rs 2 lakh. Notably, Shashi Rawat was wrongly implicated when Rs 2 lakh were withdrawn from the Nagar Palika, apparently by Saxena and Ved Prakash Gupta in her name, during the Mussoorie Autumn Festival in 2003. It is been alleged that the two accused had issued a bearer cheque in Rawat’s name and Gupta had withdrawn that money from the bank. This news has created an uproar in Mussoorie and the locals are demanding strict action against the accused. “I think that this is a big victory for truth as well as for the RTI Act,” said an elated Shashi Rawat. Executive officer Harshwardhan Mishra was not available for comment. According to other officials, Saxena and Gupta have retired and therefore, it may be difficult to take disciplinary action against them. In a memorandum submitted to the Chief Minister Maj Gen B.C. Khanduri (retd) today, the members of the Part-time Lecturers Union have asked for the introduction of the Bill. “We have already met secretary education Anjali Prasad and leaders from the BJP and Congress. But we have not received any favourable response,” said president of the union Dr M.S. Bisht. As many as 210 teachers, who have given a minimum of two years and a maximum of 20 years of service, are apprehensive that their demand for regularisation may not be met, especially after the HNB Garhwal University, Srinagar, has been accorded the status of a central university. The union members also point out that the proposed Uttarakhand State University Act is silent on the case of regularisation of part-time and contractual teachers. “We are afraid that our case will not be considered especially after the university gets central university status though a proper procedure was followed for our appointments,” said S.C. Bahuguna, general secretary of the union. Under the leadership of BJP Mahanagar president Viney Goyal, party members and activists gathered in huge numbers outside the district magistrate’s office in the afternoon and raised slogans against the UPA government. The protesters rued that despite a drastic dip in oil prices at the international level, the relief given by the Central government was too less. Terming the recent reduction in fuel prices as completely insufficient, BJP leaders demanded more cut in the fuel prices. 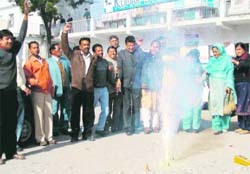 The protesters also submitted a memorandum to the President Pratibha Patil through district magistrate Amit Singh Negi. BJP leaders have requested the President to issue instructions to the Union government to further reduce the fuel prices and also the prices of other petroleum bi-products. Even as the state cabinet’s decision to re-impose entry tax on 20 trade goods is subject to ratification in the state assembly session commencing from December 15, there is a strong feeling in the official circles that petrol and diesel would be the commodities coming under the tax hammer. “As of now, the government is not thinking on these lines especially as the decision is yet to be cleared in the Assembly,” said chief secretary Indu Kumar Pandey. But he did not rule out the possibility once the decision is ratified. “We may resort to it under emerging fiscal pressure. In the ongoing crunch situation, it is just a precautionary measure to augment resources as and when needed,” he said. Therefore, the consumers would have to bear if the benefit of cheaper petrol and diesel by Rs 5 and Rs 2, respectively, is offset if the government goes ahead with entry tax on both items, among others, to shore up dwindling revenue collection. Official sources said the government’s decision in this regard should not be surprising, as the state cabinet did not decide about the entry tax just as an academic exercise. “What is the fun if this is not to be implemented,” quipped an official. Uttarakhand is giving a subsidy of one rupee per litre on petrol and diesel. Already, the Congress party has cried foul over the government’s decision to re-impose entry tax up to 5 per cent on 20 items, including cigarettes, petrol, diesel, electronic gadgets, cars, two-wheelers, televisions and computers. Congress leaders argued that the proposed measure would push inflation. However, the government claimed the measure would be of compensatory nature, as the money raised thus would go to Trade Development Fund. Besides deployment of police officials at various points near the Academy, cops have also initiated door-to-door search operations. According to senior police officials, an identification drive was undertaken in at least ten villages surrounding IMA. Some of these areas include Ekta Vihar, Methibari, Panditwari, Prem Nagar, Nandi Ki Chowki, Old Post Office and Chaman Vihar. Meanwhile, on conditions of anonymity, a senior police official said: “It is beyond our understanding, why some people are unnecessarily creating a scare over security issue. It is a fact that in the past, IMA had been on target list of the terrorists, but the issue is being blown out of proportion.” He added that the IMA has not received any threat through e-mail, as reported in a section of the media. Albeit the state has four cricket turfs in Dehradun, none of them are being used during district tournaments by any of the cricket associations here. Hence, players going to other states find it tough to adjust to turf wickets. The turfs are there at the Indian Military Academy, Maharana Pratap Sports College, Abhimanu Cricket Academy and Doon School. While the ones at IMA, Abhyimanu and Doon School are for personal use of the respective institutions, the one at Maharana Pratap Sports College is too far away from the city to be of any use to players or for holding tournaments. Notably, it costs around one-and-a-half lakh rupees to prepare a turf wicket and once made, they undergo little wear and tear. “It just requires regular maintenance. The chances of a player getting hurt on such a wicket are minimum. There is no uneven bounce on a turf wicket,” said vice-president of the District Cricket Association A.S. Mengwal. Such a wicket can be prepared in four months, he added. “Even the players participating in the All-India Uttaranchal Gold Cup found it difficult to play on a normal mat wicket at the Rangers ground,” said Mengwal. He said players like Dhoni, Sehwag, Gautum Gambhir, R.P. Singh, Suresh Raina, Praveen Kumar and many others have come to the city to play in this tournament, but they refused to practice on Dehradun wickets to avoid getting injured. Praveen Kumar visited Dehradun before his Bangladesh tour, but he refused to practice here to avoid any injury before his tour. “The normal mat wickets have uneven bounce, which could cause serious injuries to players,” he said. Even the players from Doon want a turf wicket to practice on. “Playing on a turf wicket is different from playing on normal mat wickets. We have to play more in the V-area, while playing on the turf wicket. The ball comes straight therefore we cannot play the cut shot too often on a turf wicket,” said Amit Kumar Lara, an opening batman who has been playing in the School National for the last two years. Players from Dehradun can only expect to have a turf wicket after a BCCI nod. “After receiving the affiliation, investment is made by the board for making the facilities available to players here,” said Mengwal. To boost up the host Gurukul team chancellor Prof. Swatantra Kumar has announced a cash incentive of Rs one lakh if the Gurukul team wins the prestigious tournament. A meeting to discuss the preparation and schedule of the tournament was held at the varsity today. Till today, 31 teams have confirmed their participation and two hockey grounds where the matches will be held are on the verge of completion. The chief referee for the tournament will be Subodh Khandekar, who is a former Olympian. The lodging and catering facilities will be inside the campus. Prof. A.K. 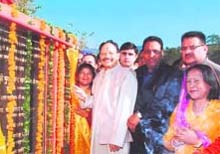 Chopra, Dr Khanna, Manudev, Rajendra Aggarwal, Santram Vaisya, Mahipal Singh, Gajraj Tyagi, R.D. Sharma and S.P. Singh will be part of the managing committee. In reply, Valley Boys Gujrada lost three wickets with the score on zero. None of their batsman provided any resistance and wicket fell at regular intervals. The team was finally bundled out for 39 runs. Sahank scored 19 runs. For Rao Cricket Academy, Sanjay took three wickets. Sahil took two and Raju and Sankar one each. Shiva from LMCC set the stage after his team won the toss and decided to bat first. Shiva scored 72 runs out of the team’s total of 188. Sourabh (29) and Lucky (42) were other contributors. In reply, the visitors were bundled out for 47 runs with four of their batsmen scoring ducks. Varanasi lost the match by 141 runs. In another match between Amritsar and Haryana, the former recorded a thumping victory by a margin of 197 runs. Winning the toss and electing to bat first, Amritsar piled up a 266 runs. Vikram scored a century and remained unbeaten on 106 runs. Roop Lal scored 51 runs. The Haryana team was bundled out for a paltry 64 runs. The expedition began on November 11 from Shivpuri on the outskirts of Rishikesh and the team cycled on the uphill route from Shivpuri to Okhimath, a total distance of 165 km. Then, the team trekked on Chandrashila Ranges (at a height of 4,000m) for 41 km. The trekking was followed by white water rafting on the Ganga from Karanprayag to Rishikesh (175 km). During the expedition, the team conducted medical camps for ex-servicemen and local residents. They planted trees and undertook “shramdaan” to remove polythene bags.